Every delicious meal begins with a good recipe: without all the ingredients, working in the right order, sequence and in just the right quantities, your dish just doesn’t come out right. 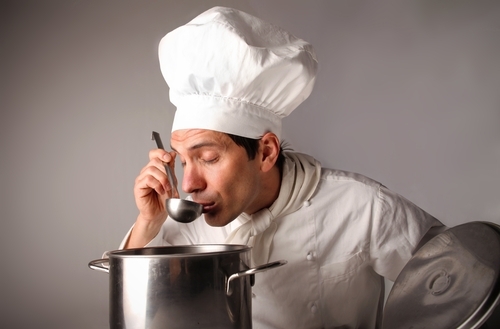 Just like cooking in the kitchen, “cooking up” great sales leads requires a list of key ingredients and a consistent process to achieve a successful result. Great chefs know how to add an intangible touch to a dish that is all their own. In the same way, sales lead generation experts know how to draw upon the special nuances and human touch of furthering a conversation, identifying a prospect’s needs, and building relationships. 1) Dials: Every sales lead begins by dialing the phone. Aim for a minimum of 20 dials per hour. 20 dials should result in 5-6 conversations (about 5 minutes each) with key decision makers. Keep your time between calls to an absolute minimum, as this is the most wasteful drag on productivity. Every minute you’re not on the phone is costing you money. 2) Contact Rate: Try to obtain a 15% – 20% contact rate. This means you must have a strategy for navigating through gatekeepers and screeners to establish talk time with decision makers. Read more here about how to manage gatekeepers on sales lead generation calls. 3) Names of Decision Makers: If you don’t know the names and job titles of the decision makers you’ll be calling, your lead generation efforts are flying blind. Make sure to obtain at least 75% of the names and titles of your decision makers before you start dialing the phone. Instead of spending time researching these names, you can purchase this data from a list broker. 4) Script or Conversation Outline: Lead generation calls should not be improvised or off-the-cuff; instead, every call needs a certain level of planning so that you are prepared to work through the conversation and guide the prospects in the right direction. Think about what you are going to say to decision makers, anticipate your prospect’s top 5 objections, and then have rebuttals ready. 5) Avoid Early Termination: Keep your script opening short and to the point. Prospects don’t like to listen to a lengthy pitch, especially if they don’t know you and haven’t heard from you before. Script shutdown or early termination of calls is the lead generation team’s worst nightmare. If you sound like you are simply reading from a sales script, you will lose credibility and the next sound you will hear is “click” as the prospect hangs up the phone. 6) Well-targeted Market: Make sure that the companies on your list are the right size, the right type of companies and are located within your trading area. There is a saying in the lead generation business, “You will be no better than the list.” Know your audience. The more you know about the companies and decision makers that you will be calling, the more successful your lead generation and appointment setting calls are going to be. 7) Accurate Data: Make sure your list is current and accurate. Bad phone numbers are the enemy of productivity. If you have a list with a 30% bad number ratio, this means that for every 10 hours you work on this list you really only worked 7 actual hours. Time spent calling bad phone numbers is just as wasteful as time spent not dialing the phone. 8) Inbound or Outbound Calls: Create effective leave behind voice mail messages to encourage prospects to call you back, or don’t leave messages at all and reinvest this time in making more calls. Decide which is the best tactic for you, depending on what you’re able to offer to generate calls back, and depending on the capabilities of your lead generation team. 9) “Come Up” System. Don’t just prospect for low hanging fruit. Create a database of all different types of sales leads, including lower priority leads, “not interested” responses and prospects who ask to be contacted again at a future date. Use a CRM program to manage your “come up system.” Given enough time and persistence, “not interested” responses can turn into promising sales leads. Your “come up” system should be a field of future opportunities for follow-up and long-term relationship building. 10) Close the Loop: Track and trend your “not interested” response data and use it to better understand why these conversations are not producing sales leads. Put this information to good use and implement process improvements. Every good chef is constantly learning, adapting, and finding ways to make new combinations of flavors from the same old ingredients – in the same way, lead generation is often a process of learning as you go along, so you can get better at converting unpromising prospects into high-potential sales leads. Just like preparing a great meal requires a long process of washing, prepping, chopping, seasoning and cooking, B2B lead generation is a long-term process of building relationships, maximizing opportunities and learning as you go along. With these 10 ingredients, your lead generation and appointment setting calls will be more likely to achieve success.